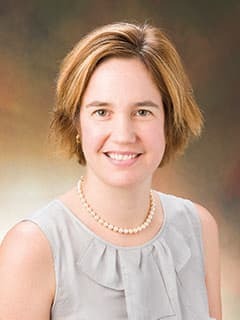 Laurel A. Weaver, MD, PhD, is a psychiatrist in the Department of Child and Adolescent Psychiatry and Behavioral Sciences and Co-director of the Eating Disorder Assessment and Treatment Program at CHOP. Dr. Weaver is a child and adolescent psychiatrist who specializes in the treatment of anxiety disorders and eating disorders in children and adolescents. She holds board certifications from the American Psychiatric Association (APA) and the American Academy of Child and Adolescent Psychiatry (AACAP). Dr. Weaver has expertise in cognitive behavior therapy (CBT) for children and adolescents with anxiety disorders as well as in family-based treatment (FBT) for eating disorders. She also has expertise in medication management for youth who require therapy as well as medications for treatment of anxiety disorders. She is Co-director of the Eating Disorder Assessment and Treatment Program at CHOP. Weaver LA, De León DD, Borgmann-Winter K, Coffey BJ. Use of metformin to control clozapine-associated weight gain in an adolescent with schizoaffective disorder. J Child Adolesc Psychopharmacol. 2010 Apr;20(2):153-7. No abstract available.